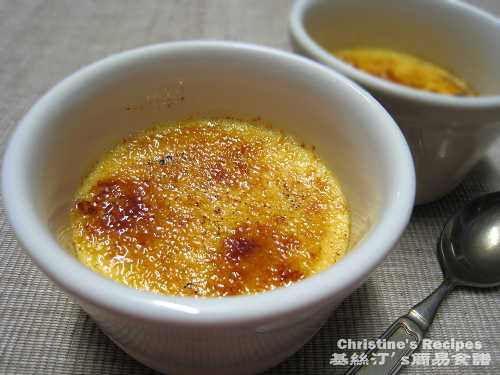 Christine請問你會不會整dominos cream brûlée puffle ?thx! 想問用白砂糖同黃糖燒有咩分別? 同埋我燒出黎冇人地D咁靚, 唔知係咪落太少糖所以好易燒燶, 試過落多D糖, 燒完出黎個樣好靚, 點知個焦糖唔脆不凸止, 仲有D韌? 我想知燒焦糖係咪有咩竅門, 例如用幾多糖, 火熗開咩火力, 燒GE時候用咩角度等? PLS HELP!!!! Christine, is thickened cream same as heavy cream? The thickened cream in Australia is pasteurized cream with galetine, contains 35% milk fat. Guess it's close to heavy cream in US. 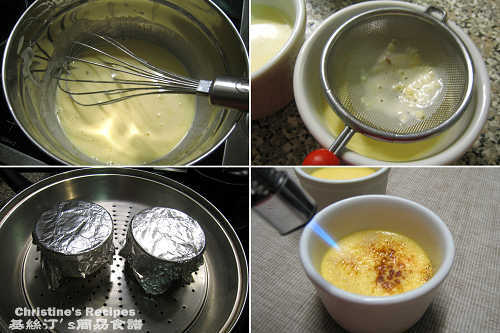 For making this dessert, heavy cream is suitable. Christine, if don't put ginger in, the rest of the ingredient will be the same? Can we use Vanilla extract instead? if yes, how much we need to put? You can skip the ginger. Just keep the rest of the ingredients. Sure, vanilla extract is fine. Add 1/2 tsp of it. 我焗完之後個燉蛋面好平滑, 唔知點解放完雪櫃雪1個鐘之後個面巢哂皮咁!!! (我無用任何保鮮子包住) 仲有個面係咪要落好多糖? 我落左少少鋪o係面,結果用火槍燒極都燒5到個效果, 燒到好似葡撻咁!係咪因為我用左白糖既關係??? please help! !